The Taylorcraft 25e was designed from the ground up with the beginner flyer in mind. 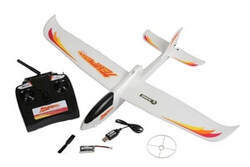 It is a high-wing monoplane which is easy to fly and quick to assemble. The airframe is conventionally built using balsa, plywood, and balsa/ply veneer to make it stronger than the average ARF, yet the superior laser-cut design allows the airplane to be kept light. Covered in genuine UltraCote®, the Taylorcraft looks great in its authentic vintage color scheme. ElectriFly Super Sportster from Great Planes. The Ranger 1.4M is specially designed for FPV beginners, with quick and easy, trouble free setup. It offers the qualities every FPV pilot looks for in an FPV Plane. The EPO foam fuselage offers good durability and easy repairs. The fuselage and wings detach for easy transportation and storage.